Justin Diercks picked up right where he left off Sunday afternoon when he captured the 2005 NASCAR AutoZone Elite Division, Midwest Series opening event at Rockford (Ill.) Speedway. 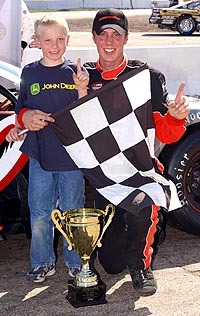 The young Iowa driver captured six wins in 2004 en route to last seasons points championship. And Diercks says he has no plans to change the successful recipe. "We’re going to go out and just try and win races and let the points take car e of themselves," said Diercks. "I like to have fun at the race track and winning is certainly fun." Finney grabbed the lead at the drop of the green from his row one starting spot with California driver Nick Joanides quickly settling into the second spot. Rookie driver Josh Bauer, Vadnais and Diercks gave chase. Diercks patiently worked his way to the front and found himself in the third position on lap 20. After opening up over a one second advantage on Vadnais and Diercks, Finney’s fortunes turned sore on lap 23 when Rhoads spun in between turns three and four, directly in front of the lead pack. Finney chose to go high to avoid the Rhoads machine but found the real estate a bit narrow and made contact with the wall. To the casual observer, the contact seemed minimal at best. 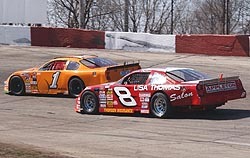 In many ways, Rockford Speedway is a tight, little, old school track that drivers either love or hate. Those that don’t like it have labeled it "Wreckford." No matter what side of the fence a driver stands on, one thing is agreed: The track is tough. Four drivers made their first career Midwest Series starts at the Rockford Spring Classic. 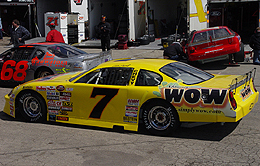 Eighteen-year-old rookie Dexter Bean fared the best of the first-timers, placing 12th after starting the 150-lap race from the 20th spot. Diecks started fifth and patiently worked his way to the front of the field on the tight .25-mile Rockford oval. Diercks did have a pair of close calls, however. The first occurred on a lap 29 restart. Dave Finney was leading with Diercks lined up behind second running Josh Vadnais. Finney had right front suspension damage but was unaware of the extent of the troubles. When the field roared into turn one Finney’s mount went straight into the wall while Vadnais, Diercks and the lapped car of Greg Fowler were sent scrambling to avoid the mishap. When the dust settled, Diercks was scored the leader and Fowler was back on the lead lap. A second close call for Diercks happened on lap 69 when he closed on the rear bumper of A.J. Rhoads and Nick Schumacher. The pair were racing each other hard as well as trying to stay on the lead lap. Rhoads and Schumacher touched as they raced down the front stretch and both ended up pinned to the turn one wall and again sent Diercks scrambling for safety. "It caught me off guard a little bit," said Diercks. "But as I’ve matured as a race driver, I realize some of the mistakes I’ve made in the past. In the past I probably would have panicked, but in that deal I just looked for the open spot and took it." California driver Nick Joanides took his first spin behind the wheel of Dave Stammer’s #45. Joanides, claiming some parts of the track reminded him of Stockton (Cal.) 99 Speedway while others just didn’t remind him of anything he’d ever seen, qualified ninth. After the invert Joanides started from the outside of row one. He ran in the top five for much of the race but drifted back in the final 50 laps and settled for 14th at the checkered flag. Kelly Bires was a late addition to the entry list, climbing aboard Bean’s team car. After a good qualifying effort, Bires dropped out of the Spring Classic just prior to the mid-point with handling problems. And rookie Nick Schumacher, making his first start in Dan and Sonya DelKamp’s #16, was running on the lead lap when he got tangled up with A.J. Rhoads while battling for position. Schumacher’s day ended after 67 laps. Josh Bauer was making his third career Midwest Series start, but first at Rockford. Bauer opened a lot of eyes by starting fourth and finishing fourth. He passed on the outside, a feat that is almost unheard of at Rockford, and he went toe-to-toe with the savvy Eddie Hoffman in the events late stages. Defending Midwest Series champion Justin Diercks had a busy off season, away from the track. He has been the guest of honor at more than one charity dinner; traveled to Irwindale, California prior to the season-ending Toyota All-Star Showdown, along with the other NASCAR regional champions, to meet L.A. area media and participate in a go-karting event; and got to spend a long weekend in New York, and take part in the NEXTEL Cup awards festivities. But according to Justin, the coolest thing that happened to him this off season was: "I got my own trading card in the new Press Pass set that came out and people from all around the country have been mailing them to me, congratulating me on my championship, and asking me to sign them. That is really cool." All in attendance were treated to perhaps the best Spring Classic weather in the 28 year history of the event. Known as the kick-off of racing in the upper Midwest, snow, rain and cold have often times greeted the fans for the early April event. Sunday, however, was a Chamber of Commerce ordered 70 and sunny…Rookie Andrew Morrissey hurt the motor on his #20 late in Saturday’s practice, went home and changed the power plant and took a provisional starting spot for Sunday’s 150-lapper. He raced from 22nd all the way to 10th…Mark Kraus returned to the Midwest Series after a two-year layoff. He spent his time away from the asphalt racing dirt late models and having a second child. Kraus had a strong run going until a broken oil line sidelined him for the day…Josh Vadnais’ runner-up finish was his best career Midwest Series run. In four Rockford series races, Vadnais has four top-ten finishes…Joe Wood called the shots for Nathan Haseleu at Rockford. It was the first time Wood had crew chiefed for Haseleu. Wood most recently was the lead wrench for Brian Hoppe’s Midwest Series efforts…Brent Kirchner posted a top-10 finish in his new ride, a car he recently purchased form nine-time series champion Steve Carlson…After Saturday’s qualifying, 2004 Midwest Series Rookie of the Year Russ Blakeley packed up and motored up the road to Lake Geneva (Wis) Raceway to run in that tracks opening weekly event. Blakeley led the late model feature until the final lap, getting nipped by part-time Midwest Series racer Jamie Wallace. The Midwest Series pays a visit to Lake Geneva Raceway on August 6. Erik Darnell’s Simply WOW Cleaner/Degreaser entry sported new, sponsor requested, paint. The new color: A snappy, eye popping yellow that is a drastic change from his traditional red. Speaking of new paint schemes, Greg Fowler turned some heads when he unveiled a sharp purple paint job on his Chevrolet. "I don’t know if coming to Rockford with a new body and brand new paint job is the smartest thing I’ve ever done," Fowler said with a smile prior to Sunday’s race. Fortunately for him, the #71 came through unscathed.